“Untouchables? Surely not. More like vulnerable…very vulnerable. You are proud of your great army? This army supposed to protect you. Well we can hit this army at its head, at its heart and we can shoot it down. In the same way that, yesterday, we shot down freedom itself. We can reach all of you: The press, the media, the army, the political class, the average citizen and the youth. No one is safe. Anyway no one can protect you. We will strike at the break of dawn. Whether school buses full of children are nearby isn’t cause for concern. We do not have a conscience or a sense of morality. We only have resentment and hatred. We are barbarian souls motivated by a destructive energy who celebrate distress, mourning, desperation and death. We feed on the blood of your elites and your leaders. We will continue to nail you one at a time into humiliation, silence, submission and annihilation. No one will be able to help. All the world’s democracies are powerless in the face of tyranny and here they are observing your demise without moving a finger, while we continue to act with total impunity. You are weak because you love life. Look at yourselves… You make us laugh”. This translated extract was written from the perspective of the supposed perpetrators of the spite of assassinations in Lebanon over the past 3 years. It catches well the state of paranoia and helplessness felt by many Lebanese and other Arabs in the face of a faceless and nameless terror. 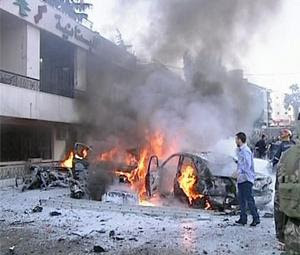 The latest attack only a few days ago targeted the prominent army General Francois Hajj. Michel Hajji-Georgiou is a Lebanese journalist and columnist at L’Orient Le Jour. Earlier this year he was awarded the Gebran Tueini international award presented by the World association of newspapers for his contribution to freedom of speech. Good writing even it does not has a face of the perpetrators. The piece is very truthful and telling of both sides, the strong side which is the killers and the other side which is the public who is helpless, fearful and marginalized. There is one case for the future, that, if these killings are perpetrated by outsiders the consequences on the outsiders communities will be disastrous. Who ever is doing the killings, with these amounts of killings, it is not going to be swept under the rug, it will fire a lots of wars. Thanx for your comment Saint. I have to say that I personally have a problem with some aspects of the extract (which doesnt prevent us from publishing it for its value).It is to do with the view that the perpetrators of these acts of terrorism whether in Lebanon or elsewhere are irrational blood suckers with no sense of purpose or values.If one looks in depth into the profile of a 'terrorist' what is mot striking is how normal and common he/she is. In my view most people can perpetrate these types of acts given the right context and circumstances. Emotional texts such as the one in the post doesnt allow us to go beyond the myth and into a useful psycho-social analysis. The view of the perpetrators is no less than human sacrifice of the brain trust of the Middle East. The love of life to them is a fault as they send the youthful that are the future of any society to their certain death. How is it they expect to accomplish any goal while they deplete their numbers and those they attack do the same? They are so wrapped up in their own twisted ideology they misread others who value God's gift of life as weak and fearful.